Success! Popularity! Fans! Page views! I win! Seems everybody wants to be Internet-important. Not to bust anybody's bubble, but government success and engagement numbers benefit from some perspective. For starters, Federal Computer Week listed the "Top Ten Agencies with The Most Facebook Fans." Tops is White House's Facebook page with (now) 375,000 fans. That's a respectable number that continues to grow. But for comparison, the Facebook page for Nutella--that chocolate hazelnut spread--has 3.3 million fans. Plus there are two other Nutella fan pages with 977,000 and 750,000 fans each. Second, there are the arguments I hear about the important power of government content and presence on the Internet. Overall, this is true. 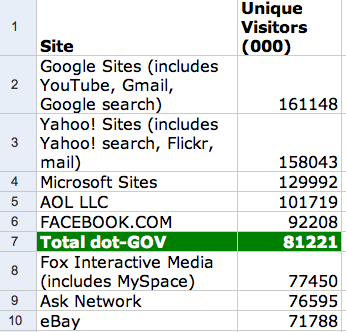 According to comScore data* all dot-gov traffic combined puts government among the top 10 online properties. Looking closer at the numbers is more sobering. Because government sites are fragmented they are less trafficked than the aggregated numbers show. For example, the online classified site craigslist.org has three-fifths (60%) the traffic of the entire government. Comparing the State Department--despite high traffic for passport and travel information, the sports-entertainment site ESPN has ten times more visitors. Commerce.gov--whose data includes hurricane and storm tracking from noaa.gov, weather.gov, time.gov--has less than one-sixth the traffic of the popular Weather Channel. And, the transaction heavy Social Security Administration has 10% of the visitors that Wal-Mart does. Government websites and social media efforts exist in a broader ecosystem. Yes, let's celebrate success, but let's first define and refine what that means. The tough news? Looking at numbers without context can lead to believing that you are more important than you really are. The good news? The fact that you are less important than you think doesn't mean that you aren't important at all. * The comScore data on government sites July 09 and regarding other media sites Aug 09. Did we do a mindmeld or something? I was just pondering this the other day while looking at our visitor numbers for MA state blogs. It's exciting watching them grow, but sobering to put them in comparison. But then again, it might be more useful to think of this in terms of categories. Your list includes the top search properties, which is as you might expect - it encompasses activities of all kinds. And since most people are going to the Internet to be entertained or to shop, you would expect sites meeting those needs to hold top spots. Looked at from that perspective, it's actually a little surprising that .GOV made the list at all! Also, visits to .GOV sites are need-driven, and visitor counts just aren't nuanced enough to measure task success. It's great that I was able to renew my auto registration online today, but I'm not likely to go back tomorrow because my visit was so successful - I just don't need to. Checking sports scores at ESPN, though, is a daily task for many people. We work with the numbers we can get, but I sure wish they did a better job at helping us determine citizen satisfaction and trust! Let's cheers for this greater victory.. and many congratulations for the near peak hype..
Sarah, I think that you nailed one of the (many) challenges to meaningful metrics. This is not specific to dot-gov, the private sector has the same trouble. There are many smart people who talk and write about the importance of having goals to measure against. For e-commerce sites the conversion is easier--somebody bought something. For drivers' license renewal, the conversion is also easier--someone successfully renewed their license. To get to more meaningful numbers we need to build our own context. Is the goal to decrease the number of people standing in line at the DMV? How do we cross that with increased use of web tools? To your point on ESPN and checking scores daily, how many gov sites believe the holy grail is volume of visits and visitors? Your smart question just provided some context for the numbers. Well done! Great post Gwynne. You hone right in on one of the reasons why when folks I work with say "hey I want the shiny new thing and the latest tool", one of the first questions I ask is: “How big and technically mature is your known stakeholder pool?”. Traffic is only one metric for performance but if one of the goals of open government is increasing the quality and frequency of interaction with the public in the provision of government services, then traffic isn't only a measure of success, but should guide those tools that we invest time and resources into in the first place. Thanks for the great stats! Thanks @jenn! 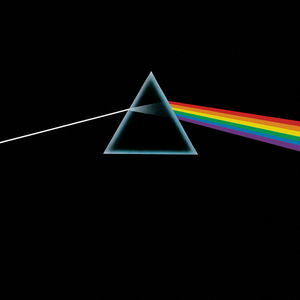 We all are looking for any tool we can to beat back the shiny object syndrome. It's hard because there are so many good, strategic use of new media. And THAT'S what we are all trying to advocate. Also, check you Candi Harrison's answer--goals and measures--on her blog.